It is necessary to wash the parts of the body that are generally exposed to dirt or other impurities. 1. 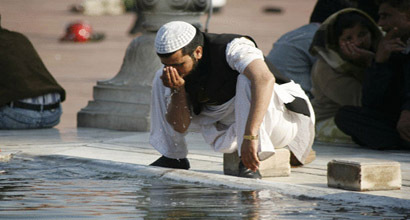 Have the intention that the act is for the purpose of worship and purification. Then, begin by saying ‘bismillah’ (i.e. ‘I begin in the Name of Allah’). 2. Wash your hands up to the wrists, three times starting with the right hand. 3. Rinse your mouth with water, three times. 4. At the same time, cleanse your nostrils by sniffing water and expelling it, three times. 5. Wash your whole face three times with both hands, if possible, from the top of the forehead to the bottom of the chin and from ear to ear. 6. Wash your right arm three times up to the far end of the elbow, and then do the same with the left arm. 7. Wipe the whole head, or any part of it, with a wet hand from the front to the back, once. 8. Wipe the inner sides of your ears with the forefingers and their outer sides with the thumbs. This should be done with wet fingers once. 9 Wash your two feet up to the ankles, three times, beginning with the right foot. This proves that such an act obligates new purification. This nullifies the ablution, regardless of whether it was due to insanity, fainting, drunkenness, or medication. It also does not matter if one was unconscious for a short or long period of time, or if one was sitting, or fell to the ground, and so on. The aspect of unawareness here is greater than that of sleeping. The scholars all agree on this point. In addition to this issue (touching the sexual organ), there are other issues that are also controversial in this regard among Muslim scholars, such as excretion of pus or blood, vomiting and eating camel meat. Previous articleWhat Are the Types of Blood Seen by Women?